The construction industry and homeowners must recognise the necessity for a sustainable home in the face of a changing climate. Designing new builds, retrofitting homes and improving existing housing stock are all essential steps. Addressing energy conservation in buildings realises the maximum potential in terms of energy conservation. With the technology available today, it is possible to increase the energy efficiency in new buildings and renovations without compromising on the aesthetics, safety, health or thermal comfort of a building’s occupants. To achieve an energy efficient building requires that the energy conservation be a fundamental part of the eco house design. 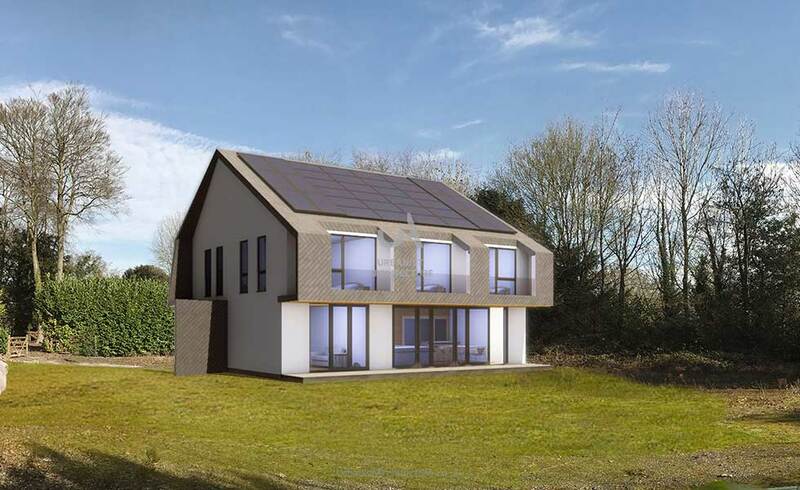 Passivhaus design is a standard for design and construction, that aims to create a home that stays at a comfortable temperature with minimal energy use. Sunlight, human and appliance generated heat are used to dramatically decrease the need for additional space-heating. 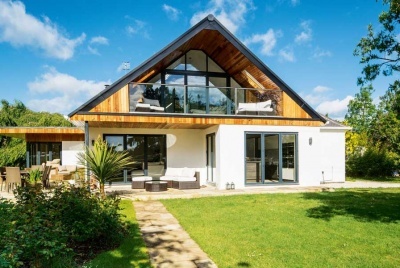 In Passivhaus design, the size, shape and orientation of a home, good heat retention, airtightness, natural ventilation and heat recovery systems are all employed with the aim of dramatically reducing the annual carbon emissions of a building. 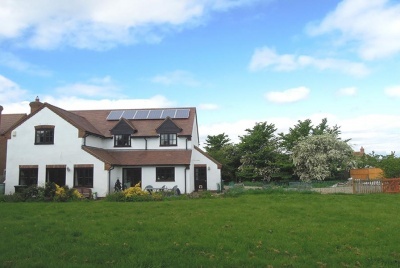 To achieve the Passivhaus standard, the energy required for space heating must not exceed 15 kWh/(m2 .This is determined by calculating the maximum amount of heat that can be delivered using the fresh supply of air at the minimum required ventilation rate. and accurate design using the Passive House Planning Package (PHPP). You don’t have to commit to the Passivhaus Standard to understand and utilise passive sources of energy. 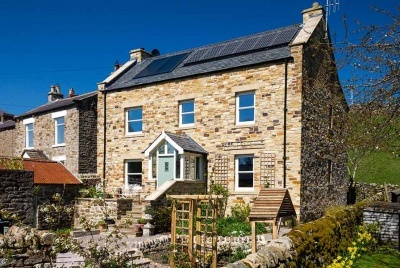 Most people are familiar with active solar energy generation – solar panels are a common sight up and down the UK and help to reduce our dependence on polluting fossil fuels. Fewer people understand the necessity of passive solar design, which allows us to more directly harness the heat and light of the sun to reduce the energy demands of our homes. One of the most important elements of passive solar design is building orientation. New buildings, wherever possible, should be orientated so that they face south (in the Northern Hemisphere). Windows should be placed predominantly on the south side of a building to maximise solar gain. While, of course, the orientation of existing housing stock can rarely be changed, retrofitting measures may still include an increase of good quality, thermally-efficient triple glazing to the south side of the structure. Seasonal shading should also be considered, however, to prevent overheating in summer. This can often be easily achieved by use of such features as extended eaves and well-positioned blinds, which will reduce high-angle sun penetration without significantly disrupting levels of natural light. The design of any building involves careful consideration not only of the external factors of a site but also, of course, of the materials of which it is made. 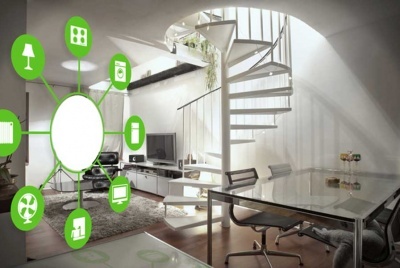 Sustainable home design should first consider the carbon cost of materials, before going on to develop designs whereby those materials can be used to create homes that keep the heat in and require little energy to heat. Eco-friendly materials such as wood from sustainable forestry, cob, and straw can all be used as alternatives to other, more carbon-costly materials in green buildings, including in those which aim for Passivhaus standards. The U value of walls, roof and floors determines the rate at which heat escapes from a building. The lower the U value, the more slowly heat will dissipate. Passivhaus standards require U values to be no higher than 0.15 W/m2 for the walls, roof and floors and 0.80 W/m2 for an individual window, 0.85W/m2 for windows fully installed. In many cases, the U values should be far lower and these are considered to be the maximum acceptable U values. (In some cases, higher than will be acceptable for building standards). If you are retrofitting energy-efficient measures, external insulation may be best since external insulation does not prevent wall structures from providing thermal mass (which helps to store the sun’s heat and release it gently at night). This can also help minimise thermal bridges which result in heat loss. Another important element in the design of energy efficient houses is that they must have very good airtightness levels. An airtight building will further reduce heating demand and can be achieved by means of barriers and membranes placed in all the elements of the building. In Passivhaus certification, the airtightness achieved by a structure is determined by an n50 test measurement. Air pressurisation tests are performed and the air escaping at 50 Pascals pressure should be fewer than 0.6 air changes per hour. Good design and implementation of barriers is essential to meet the rigorous standards. When implementing airtightness, it is also important to consider the ventilation needs of a structure. Natural ventilation allows for a cooling of excess temperature and a healthy and comfortable air flow by means of cross ventilation, which can be achieved by understanding of the way that air moves through a building. It is a requirement of Passivhaus certification that a building does not experience temperatures higher than 25 degrees Celsius for more than 10% of the year. In summer, natural ventilation can play a part in the maintenance of a low energy building, though in the winter, natural ventilation can result in undesirable heat loss. In order to reduce heat losses further and yet maintain indoor air quality, airtight designs often incorporate mechanical ventilation with heat recovery (MVHR) into the designs. These systems work by extracting air from warm, wet rooms such as bathrooms and kitchens and passing it through a heat exchanger which passes this warmth to fresh air coming from outside. Fresh, pre-warmed air can then be released back into living areas of the home. For Passivhaus certification, the heat recovery efficiency of a ventilation system must be equal to or greater than 75%. A fan power of less than or equal to 0.45 Wh/m3 is required and thought should also be carefully given to potential noise pollution and sound transfer between rooms. Good insulation and solar orientation will help create a home that has a low heat-energy demand to start with, but homeowners must also take other measures to reduce energy usage. Choose appliances with A+++ rating and opt for highly efficient lighting (such as LED). It may also be worth looking to photovoltaics and other means of local energy generation to meet the low electricity requirements of the home. Active solar measures can be taken to reduce the energy load of heating water by pre-heating. Hot water heating systems and heat losses incurred through their implementation can be the Achilles heel of eco and Passivhaus design if not carefully considered at an early stage in the process. One of the major considerations for a green home design should be the use and management of water. Many eco designs will incorporate water saving measures such as low-flush plumbing and water recycling. Re-use of greywater and even the treatment of waste water in reed beds or other natural filtration systems is recommended where possible. Alternatively, sustainable homes may also incorporate composting toilets and other alternative waste management options. If you are opting for Passivhaus standard, regulations mean that immense care must be taken over ingress and egress points for any pipes and the heat that can be lost as a result of the installation of certain water systems. Waste management considerations also extend to the general household waste that will be generated within a home. A zero waste home should aim for as much of a reduction in generated waste as possible and allow for as much on-site recycling, composting and reclamation of waste materials as possible. Waste should also be considered through the construction or renovation phase. In sustainable building and renovation, as much waste as possible should be kept from landfill. Of course reclaimed materials should also be used where it is a good idea to do so. There may also be consideration of the eventual disposal of materials used at the end of the life of the building. A truly sustainable dwelling house is one which is ideally suited to its situation and to those living in it. First of all, in order to ensure that a home’s design is optimised to reduce energy consumption and ensure year round comfort, a bioclimatic chart can be used to make sure that the designs are perfect for the climate conditions of the area. Such a chart can also be used to determine the measures that are best employed with a given house to add value and reduce its current energy use. Designers may also employ vector diagrams to determine the sunlight strength and direction at a given time of day and time of year and to consider other elements such as wind direction and strength, the effects of which can be mitigated with good design. Liveability is also key to good sustainable home design. Passivhaus regulations take into account the comfort levels required for healthy living when it comes to heat and air flow. Light levels are also good in a home with passive solar design features, as much thought is given to how rooms within the home are to be used and how they will relate to one another. Main living spaces such as living rooms and dining rooms will take advantage of the glazing to the south, while the less-glazed north side of a passive home will often be given over to rooms where light is less important, such as bathrooms, utility rooms and storage space. Adaptability is another factor in sustainable home design. Sustainable homes must be built to be adaptable to many different eventualities. This adaptability is especially crucial in the face of our warming planet and changing weather patterns that make forecasting much more difficult. By being largely self-contained and requiring little external power to operate successfully, a home with other sustainable and environmentally friendly features, can weather the storms, literally and metaphorically. Those who design ethical and environmentally friendly housing must consider far more than just the energy use of each building. In sustainable home design, it is important to remember that no building exists in a vacuum and it is important to consider any home in the context of its environment. A truly zero carbon home would facilitate the goal of a zero carbon lifestyle. This could include such features as growing space for food; bicycle storage space and perhaps features such as workshops or home offices that make it easier to work flexibly from home. Even in a city or high density area, provision can be made for food production through green roofs, vertical gardens and space for container growing. Such features can also be incorporated into insulation plans. A successful sustainable design for a home with a garden will allow for easy transition between the two and a blurring of the boundaries between inside and out by incorporating features such as verandas and conservatories – both features which can be helpful in different ways for passive solar design. The design of a zero carbon house begins with the materials, but it ends with a thorough understanding of those who will one day call it home and how it will feel for them to live there. Mr Irkus Altuna BA(Hons) DipArch MArch ARB is an award-winning young London architect. He works at Urbanist Architecture Ltd and specializes in designing new build eco homes.